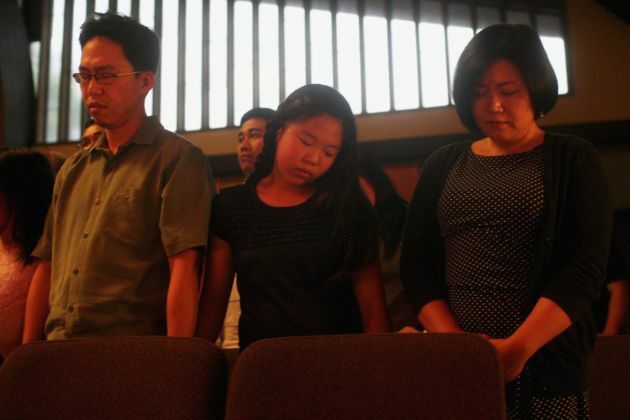 (Photo: REUTERS / Matt Mills McKnight)From L-R: Andrew Chung, Ella Chung, and Terri Chung pray during a vigil for Kenneth Bae in Seattle, Washington August 10, 2013. Bae, an American Christian missionary imprisoned in North Korea is in deteriorating health and has been moved from a prison work camp to a hospital within the past two weeks, sister Terri Chung said at a vigil for her brother on Saturday. Bae was sentenced in May to 15 years of hard labor after North Korea's Supreme Court convicted him of state subversion. It said the 45-year-old had used his tourism business to form groups to overthrow the government. WASHINGTON DC (Reuters) - The case of a U.S. citizen jailed in North Korea is a human rights issue that has no connection to long-stalled talks over Pyongyang's nuclear weapons, the State Department has said. Robert King, U.S. special envoy for North Korean human rights issues, is slated to travel to Pyongyang on Friday. The State Department on Tuesday described his trip as a "humanitarian mission" aimed at winning the release of ailing Kenneth Bae, a Christian missionary and tour operator. The release of Bae, sentenced by North Korea's Supreme Court in April to 15 years of hard labor for state subversion, would remove a big irritant in U.S. relations with Pyongyang. State Department deputy spokeswoman Marie Harf said on August 28, however, that King's trip is unrelated to international diplomacy over North Korea, which has conducted three nuclear weapons tests since 2006. "I don't want to link the two in any way," she told reporters. "We have repeatedly said that separate and apart from any of the other issues we talk about with North Korea that Kenneth Bae needs to be released immediately," added Harf. Harf reiterated Washington's position that it expects North Korea to live up to a denuclearization-for-aid deal it signed in 2005 at six-party talks in Beijing. Those talks involving China, Japan, the two Koreas and the United States have been frozen for nearly five years, during which time North Korea conducted three nuclear tests and a series of long-range missile launches that prompted stiff U.N. sanctions. "We will continue to hold (North Korea) to those commitments and its international obligations," said Harf. "The onus is on North Korea here," she said. North Korea said in July it would not give up its nuclear deterrent until Washington ends its "hostile policy" towards Pyongyang, although it was ready to revive nuclear talks. The two countries do not have diplomatic relations and official visits between them are rare. Bae, 45, was detained in November as he led a tour group through the northern region of the North Korea. The court that sentenced him said he used his tourism business to form groups aimed at overthrowing the government. Bae's sister, Terri Chung, told Reuters on Aug. 10 that her brother was moved from a prison labor farm to a state hospital because he suffered from a range of health problems, including an enlarged heart and chronic diabetes. Asked about King's trip, Chung said on Wednesday: "We are hoping and praying for Kenneth's release, but we are declining interviews at this time due to the uncertainty and sensitivity of the situation." The foreign ministry of Sweden, which handles U.S. interests in Pyongyang, said it understood Bae was still in the hospital, where Swedish diplomats had last visited him on Aug. 9. Bill Richardson, a former U.S. ambassador to the United Nations who has traveled to North Korea to retrieve detained Americans, said he was optimistic for Bae because it was unlikely King "would be going unless it looked good." Previous trips, including those by former U.S. Presidents Jimmy Carter and Bill Clinton, as well as his own visits, involved "outsiders and not official representatives," Richardson told Reuters by telephone. "This time it's an official representative, which is a good sign," he said. "Hopefully it will mean that the North Koreans will say something positive about resuming the dialogue, which I believe is very much needed." he said.